Why are social skills important in robots that interact with people? Primarily because social skills are basic forms of expression that lead to acceptance and trust. When interacting with someone, we use various social skills that we have been taught or have keenly observed: body language, hand gestures, facial expressions and tonality. Robots must develop a sense of verbal and non-verbal cues inspired by human beings. Can you talk about the potential of virtual reality for an ageing population? It is critical to stimulate the brain as well as maintain constant physical activity. The use of AR/VR associated with Kinect motion technologies is a progressive topic in the healthcare domain. Elderly people can play games such as virtual bowling or stacking boxes etc. These movements and neural connections are important for physical and emotional independence. You have introduced the concept of robotic presence. Can you explain that to us? Robotic presence is a result of how “positive” robots are perceived within their target groups. It is dependent on the human responses that result from the robot’s actions and behaviors, which will only be improved through the calibration of aesthetically human-like features and relatable interactive capabilities. How can we divert the focus from the fear and negative aspects of robots to a positive and trusting relationship? People must become more comfortable with human machine interaction HMI and the only way to do that is through increased production and safe interaction or touch points. To a certain extent, we are already familiar with computers and trust them to handle banking and insurance and tax information. As such, robots must be introduced as instruments of higher value, such as better time management and quality of life. You say human machine interaction (HMI) is far from complete and sometimes not desirable. Why? Human contact is an irreplaceable means. As an example, we perform certain operations for in-home banking but we still go to the bank physically to talk to someone and gain more information. It comes down to qualities like empathy and the importance of face to face communications, which although has to some extent been replaced by mobile screens, is still deeply rooted in human processes. What is going to be the level of HMI in public spaces, household equipment and cars? We will see it with the emergence of the Internet of Things (IoT), set to release billions of devices around the world in the years to come. The basic idea is that sensors will be dispersed in public spaces, households, offices and transportation mediums. All of those will be collecting data points and communicating with each other through cloud computing. HMI technology is simply the process of interacting with these machine devices, like using single-touch or multi-touch display panels, push buttons, a mobile device, or a computer with a keypad. Do you have some examples of where HMI is already in play in our society today? ATMs are a prominent example of ubiquitous human-machine interaction. Call centers are at the fringe of adopting this technology globally, making it possible to use advanced speech recognition features to guide customers to the right service, department or representative. Similarly, mobile phones speech recognition is a good example. Do you think there will be or needs to be a “killer app” that will transform and disrupt our thinking and reliance on HMI in the future? I’m sure someone is thinking up something so I wouldn’t count anything out. But, as we stand today, I think the important point is the continual combination and intersection of artificial intelligence, multimodal interfaces and aesthetics. We want machines that appear friendly and comprehensive but also deliver quality care and effective results. 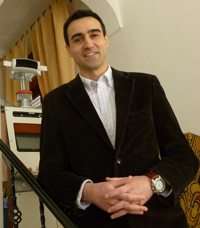 Antonio is an IEEE member and robotics researcher. He is also a member of the IEEE Robotics and Automation Society.